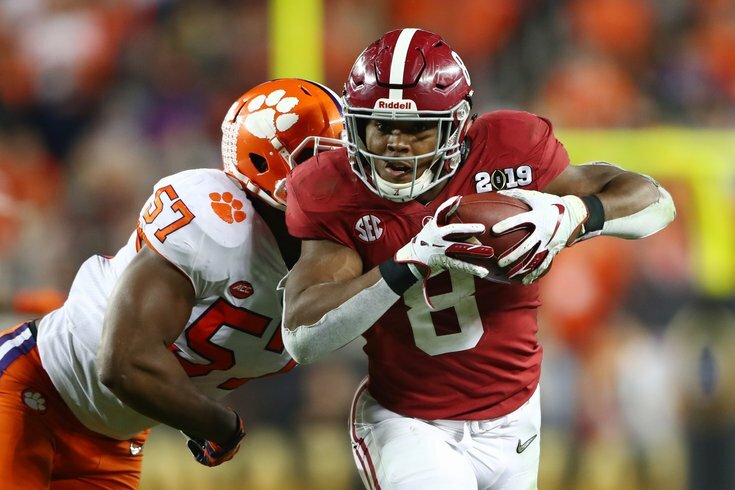 It's Josh Jacobs in a landslide, although the Eagles did acquire Jordan Howard. On Monday, we published our fourth Philadelphia Eagles-only mock draft of the offseason. Today we'll take a peek around at some of the national guys and see who they have going to the Birds at 25th overall. Philadelphia has done a nice job filling holes this offseason. DeSean Jackson can replace Golden Tate. Malik Jackson is an upgrade on Haloti Ngata & Co. at defensive tackle. Vinny Curry will help with Michael Bennett moving on. GM Howie Roseman hasn't addressed the secondary, however, outside of bringing back Ronald Darby on a one-year deal, which means Philly could target a safety or corner in the first round or with one of its two second-round picks. Abram (5-foot-11, 205 pounds) is my top-ranked safety, a physical tackler who showed off 4.45 40-yard dash speed at the combine. #JimmySays: The last time the Eagles took a safety in the first round was in 1980. Well, sort of. It was Roynell Young, who started his career as a corner, and later had a stuffed animal seal named after him by Jimmy Kempski. I loved Roynell the seal, and he loved me, and we weren't ashamed. Anyway, I find it very unlikely that they'll take a safety in the first round this year when they already have two starters there, even if one is aging and the the other is in a contract years. Think trenches. #JimmySays: To note, most of the people mocking Jacobs to the Eagles did so before they traded for Jordan Howard. The guess here is that they might have otherwise gone in another direction. I personally believe that Jacobs should still be on the Eagles' radar anyway. Running back is a big need for the Eagles, and Jacobs' less-than-ideal 40 time (unofficially 4.60 at his pro day, per NFL Network analyst Daniel Jeremiah) has no bearing on his likely success on Sundays. #JimmySays: Reuter did a four-round mock draft. He also had the Eagles taking OT Tytus Howard, LB Mack Wilson, DE Oshane Ximines, and OG Nate Davis. #JimmySays: Yeah, Jacobs' total rushing yards don't mean much when he didn't get the ball as much as he should have. #JimmySays: Yep, he would indeed be a good fit. After the 2017 season there were questions about Gardner-Johnson's tackling ability but he proved he's more than capable in '18, and his coverage ability makes him an attractive option for the Eagles. #JimmySays: I like Gardner-Johnson, and think he'd be an excellent fit in the Eagles' defense, but this is way too early for him. With Haloti Ngata and Michael Bennett gone, the Eagles add to their defensive line with Wilkins, a workmanlike prospect who can carry out multiple duties. #JimmySays: It would be shocking if Wilkins is still there at 25. Eagles get No. 13 for No. 25, 53. The Eagles have an extra second-round pick after their trade out of the first round last year, and that means they have the ammo to jump into the high teens this year if they see a key prospect available. And after White slips out of the top 10, he's the perfect guy to move up to grab and plug into the middle of the Eagles defense behind a strong defensive line. #JimmySays: No way. I can see the Eagles being aggressive and trading all the way up to pick No. 13, but they haven't drafted an off-ball (non-edge-rushing) linebacker in the first round since 1979. If they were to make a bold move up, it would more than likely be for an impact pass rusher. It won't be for a player who plays a position they have clearly shown they don't value. They have to improve their running back situation and Jacobs is the best of this year's group. Don't worry about his 40 time. This kid is good. #JimmySays: That's now five votes for Jacobs, again, pre-Howard. Jason Peters can't play forever (right?) and the Eagles need to prepare for the future. Getting Dillard in now would give them time to work on his run blocking reps (Mike Leach didn't do much of that) and get him prepped to take over for Peters. #JimmySays: It's not a zero percent chance that the Eagles draft an offensive tackle early, but it's unlikely until they know what they have (or don't have) in Jordan Mailata. The Eagles could always opt for a defensive lineman, of course, but the secondary seems like a bigger need right now. #JimmySays: There are currently six cornerbacks on the roster who are locks to make the team. Are they keeping seven, and if not, who are they trading for 50 cents on the dollar to make room for another one? It’s a total hunch pick from me here. With RB Joshua Jacobs gone, we’re not taking another back here. The Eagles could use a defensive tackle, but would you go safe here with one? Take a gamble on Mississippi State’s Jeffery Simmons and wait until his ACL heals? Or go with a safety who has intriguing skills and versatility, and might be a sound long-term plan at safety? Take the latter. #JimmySays: Again, I just think there are better players available here. The Eagles need to find a young tackle they can groom to eventually take over for Jason Peters, and a versatile blocker like Risner would be ideal, Given his skill set and experience at other positions, he could make an immediate impact as an interior player before eventually sliding outside. #JimmySays: I think the player is fine here, though it's maybe a little bit of a reach. I do think that a player like Risner would make sense at tackle if Mailata doesn't work out, and inside at guard or center if he does. The Eagles are becoming the full embodiment of analytics twitter, as they have chosen to just forget about the running back position completely. Though that may be trendy and progressive, I do think that Jacobs would be the right pick for them if he is available at No. 25. Jacobs can do so much more than just run the ball. He's a willing blocker and a difference maker as a pass catcher. He's the only running back I can see going in the first round, and this is where he should go. #JimmySays: I do agree that if there was a scenario in which the Eagles could take a running back in the first round, this is the year. #JimmySays: Like in one of the scenarios above, Drafttek has the Eagles trading up with Miami to pick No. 13. While I agree that the Eagles would be targeting a pass rusher with such a move, I don't agree with the player. Burns has the potential to be a great speed rusher in the NFL, but he's skinny, and there have to be concerns about his ability to set the edge in the run game. I think he's a better fit as a 3-4 OLB, and if you're going to trade up for someone, that guy should be a really clean fit in your defense.